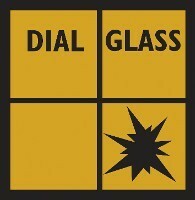 Dial Glass stock and supply a wide range of glass and can offer a glass cutting service while you wait. The most common of glass types and accounts for a large percentage used in windows and double glazed units. 2mm, 3mm, 4mm, 6mm, 8mm, 10mm, 12mm and 15mm with larger thicknesses available to order. A safety glass made up of 2 sheets of glass with a pvb interlayer. When broken it remains intact and safe. This is used in doors and shopfronts. 4.4mm, 6.4mm, 7.5mm, 8.8mm, 9.5mm, 10.8mm, 11.5mm, 13.8mm are in stock or available to order. Acoustic laminated is also available in 6.8mm, 8.8mm, 10.8mm, 12.8mm and 16.8mm. A safety glass which goes through a heat process and once toughened cannot be cut or worked on. Glass is ordered to size. 4mm, 6mm, and 10mm being the most common. Mainly used for table tops and furniture covers. From 7.2mm 30 minutes to 27mm 60 minute rated, Let us know your requirements and we will find the correct type of fire glass. We hold in stock the complete Pilkington range of obscured glass. Grey, Bronze and Blue is available to order. Toughened glass is a safety glass which goes through a heat process. Once toughened, it cannot be cut or worked on. Predominantly it is used for tabletops and furniture covers. This glass is ordered to size, with the most common being 4mm, 6mm, and 10mm. Once we have identified your specific requirements, we're able to help you find the type of fire glass which is best suited to your needs. It ranges from 7.2mm 30 minute glass to 27mm 60 minute rated. For something that stands out, opt for our beautifully patterned or tinted glass. We stock the complete Pilkington™ range of obscured glass. We also have a collection of bronze, blue, and grey tinted glass which is available to order. Contact our glass merchants today, in Gillingham, Kent, to receive further details about our professional glass cutting services.